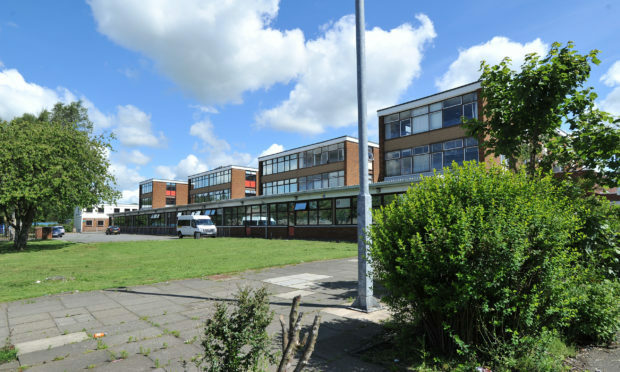 Woodmill High is one of the schools that could be replaced. Ambitious plans for a joint learning campus on the outskirts of Dunfermline have taken a step forward after councillors backed the move. However, the £90 million project, which could see replacements for St Columba’s RC High and Woodmill High built on the former Shepherd Offshore site, alongside a proposed new Fife College campus, is still dependent on “significant” additional funding from the Scottish Government. And yesterday, Fife’s education and children’s services committee was told that commitment is far from guaranteed. Councillors formally endorsed plans to draw up an option agreement to purchase the land near Duloch. This would allow Fife Council to progress the proposal if and when funding becomes available. A bid will also be put to the Scottish Government, which pledged to invest £1 billion in schools across the country in November. Education chiefs said the agreed steps would put Fife in the strongest position possible when the time comes to distribute the funding. Committee members backed the proposal, although Dunfermline Labour councillor Helen Law warned against trying to “cram two or three entities under one roof”. Ms McLean said the service was working towards maintaining the schools’ individual identities. Committee member Alistair Crockett noted a “super campus” idea had been mooted five years ago, and said he hoped the proposal would not become a “Madras situation” – referring to the lengthy delay in St Andrews over a new school. Ms McLean stressed that there would be wider engagement with the community before any future plans come forward. St Columba’s RC High and Woodmill High are both facing capacity issues over the coming years and maintenance liabilities of around £9m and £24m respectively. Four sites were considered, namely Fife College’s existing site, Shepherd Offshore, Masterton and Pitreavie fields. However, the college site will only become available when the college has relocated, Masterton is being redeveloped for other uses, and Pitreavie remains an important focal point for sport and recreation activities.